GALLÉ, DESIGN FOR LUXURY BRANDS: Brand naming, identity, packaging and communication assets design for Monteluz, the Peruvian premium pisco brand. Monteluz is to pisco what Screaming Eagle is to Californian wine and Westvleteren is to Belgian beer. Not only is it a fantastic pisco, it is also a perfect example of what we call a "cultural product". Gallé designed Monteluz's identity to be the only brand that focuses on the nation's history from the late Renaissance to the Enlightenment, the time when Europeans first started planting vines in Peru. The result is a brand that curates its baroque aesthetic, and that expresses its identity with a lot more depth and authenticity. The name Monteluz (which means "mountain of light") was inspired by the sun rising in the early morning in the valley of Ica, Peru, where it rises behind the mountains and makes them appear to be made of light. Light is very important to the Monteluz method: the grapes are picked at night, to avoid fermentation during the transport from the vineyards to the winery. 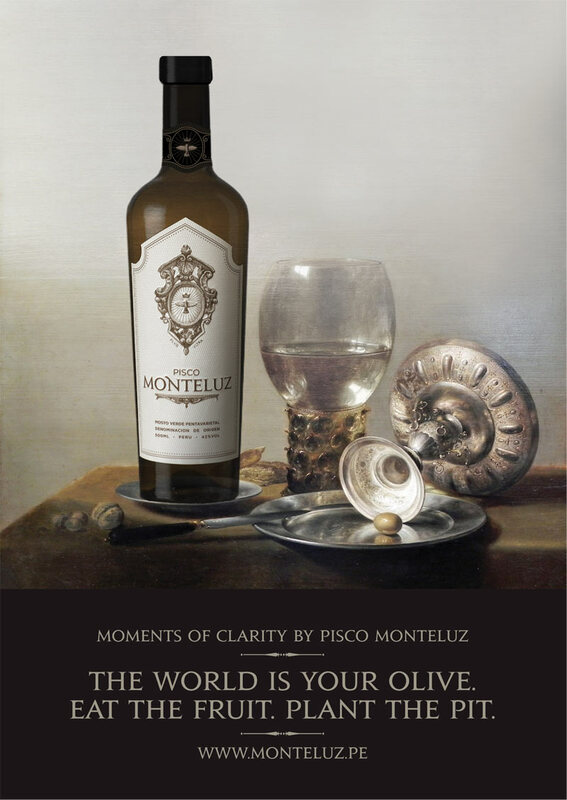 Monteluz is also the only pisco to be sold in a dark bottle, to protect the brandy from the light. The theme of light, and of enlightenment, dominates the brand identity: the brand icon was inspired by Bernini's Holy Spirit, which is a stained glass artwork of a dove emanating light.